I like to share stories of people overcoming obstacles. This story has at least two to note. 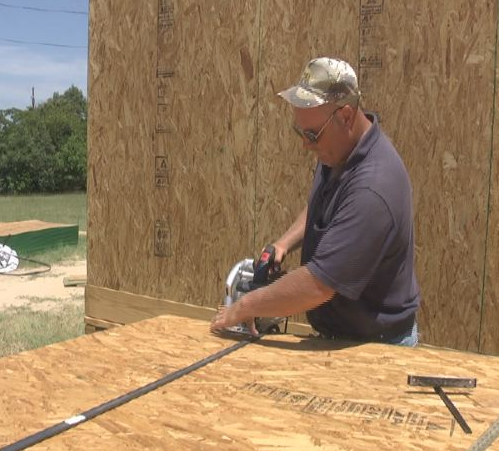 Thomas Graham is a blind man from Tyler, Texas who didn’t let his lack of sight prevent him from building a three bedroom, two bathroom ranch – done by himself in five months. So first, be inspired and go for your goal today. The second point deals with upbringing. At 18 years old, we don’t always make the best choices. Do we? I didn’t. But, we hope those choices don’t define us or hurt us for life. Thomas made a poor choice of going with his father on a failed robbery attempt. His father was killed and Thomas lost his eye sight getting a face full of shotgun pellets. Through six years of prison and beyond it’s been a lifetime of healing for Thomas (although he has an excellent sense of humor and you’ll see in the video). Be inspired. Thomas said, “I truly hope that there are people who think that they can’t will find something within themselves and say that, ‘I can. '” There is a full story on CBS here.